Yep. I love my Salads and Dressings, but not just plain old ordinary salads & dressings. I love big salads loaded with big flavors and fun, bold dressings. 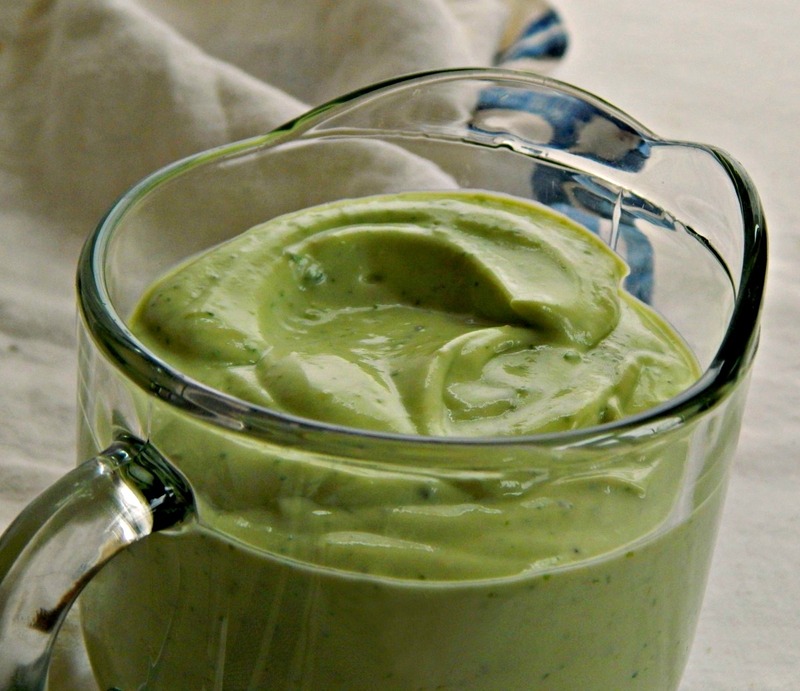 This Avocado & Cilantro dressing is one of them. Creamy, bright and flavorful, this will totally transform anything you put it on. I mean, hey, don’t limit yourself to salads, here! Add it to tacos, burritos, bowls, fish, put it over eggs or just use it on anything that could use a bit of bright, tangy, creamy, limey freshness. Speaking of fresh, this really is (although a three or four days in the fridge does no harm) and it beats the pants off any bottled or jarred version. Plus, you get to customize your own! Add more lime, more cilantro (or no cilantro if you’re a hater) or a bit of sugar or honey or more or less olive oil. Make it as thick or as thin as you’d like. Make it your own. Drop all ingredients except water into a blender and blend. Add water to thin to desired consistency. I’ll be bringing this recipe to Angie’s Fiesta Friday, hosted this week by the incomparable Jhuls @ The Not So Creative Cook. Do stop by and take a peek at all the bloggers linking up their best creations. This entry was posted in Click here for Fabulous Food Posts and tagged Avocado, Lime, Mexican or Southwestern, Salad Dressings, Yogurt. Bookmark the permalink. Yum! That looks delish! I love the creamy texture of avocados. I wonder if sour cream would be a good substitution for the yogurt? Hi Lina, I just love it! I used it all thick like this for our Carne Asada Steak Salad, and then thinned it out to a vinaigrette for another. Great both ways! It’s very good – the avocado does not come through in taste as much as I thought it would, but since it only uses half, there’s plenty more to just eat…never a bad thing!! This looks wonderful! Perfect recipe! I will be making this in the near future, thanks for sharing! Delicious Mollie and I love that it’s packed with healthy ingredients – the first time I’ve seen avocado used like this in a salad dressing…. Hi Tracey and thanks! I never seem to have time to get around and visit as much as I’d like so awards are difficult. I really appreciate it, though! You’re welcome – and I completely understand. I keep trying to get the post out, but I had to post the steak first!! 🙂 Sometimes I just HATE spring. Nice, then cold, then damp, bone aching wet cold, then grey, then a nice day just to tease you, then more cold and wet and muddy…bwaaah! I just love all of these flavors and this dressing would be so good on a salad or drizzled on a taco! This looks wonderful. I think it would be good with lemon, too, and I’d use it as a chicken marinade. Yum! And yes I did eat some by the spoonful, and put some on some toast, too!! This sounds fabulous, Mollie. I need help with avocados, since I keep buying and then don’t know what to do with them. I seem to be the only person with an avocado problem! No – as a matter of fact that’s part of the reason for the dressing, lol!! I’m REALLY bad with pears AND avocados – you wait and you wait and you wait and then you look and it’s too late! ughhh!